My friend Gordon Russell sent me a letter recently describing a wildlife encounter. He had been following deer tracks along a stone wall when a movement caught his attention. 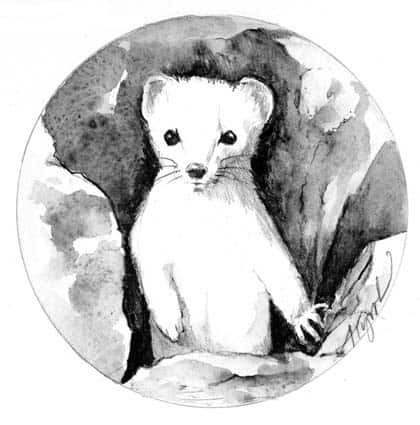 “Almost before its image could travel to my brain,” he wrote, “the white head of a weasel vanished in between the stones.” The animal popped up again, disappeared, and then revealed itself a third time, next to where Gordon was standing. There are two kinds of weasels native to our region, the long-tailed and short-tailed. Good luck telling them apart. Their coats are almost identical (at our latitude, both are typically brown in summer, white in winter), and although long-tailed weasels are bigger on average, the two species overlap in size. As for tail length, this distinction is not as obvious as the names suggest, and I’ve yet to meet a weasel who was willing to wait around while I took measurements. Most sightings are one-blink blurs. Weasels are elusive and shy of people–except when they’re not. These tiny carnivores have a reputation for audacious behavior. At times, their antics suggest a total indifference to self-preservation. Gordon’s encounter is one example. Another account I heard last winter involved a game of tug-of-war between a man and a weasel over a dead mouse. Or consider last year’s Internet meme of a British weasel riding a flying woodpecker. Later reports suggested that the image was authentic, and indeed, it turns out there are other documented cases of weasels pouncing on birds and refusing to let go, even when they became airborne. How to explain such weasel Evel Knievel behavior? According to biologist Carolyn King in her book, “The Natural History of Weasels and Stoats,” understanding these animals’ ice age origins is the key to understanding everything about them. Weasels evolved to chase burrowing rodents deep beneath the snow. This specialization produced a body type that was perfect for hunting in tight spaces. They’re small–even an adult male long-tailed weasel has a skull that measures at most a little over an inch at its widest point–and anywhere the head can go, the rest of the body can go, too. Weasels’ hips and shoulders are narrow. They have thin coats and little in the way of fat. Their spines are exceptionally flexible, and their legs are stubby, which means that they don’t require much room to push their bodies forward. Their long necks–I once mistook one for a bird, at a distance–permit them to carry prey out in front of their chests, instead of dragging the carcass in between their front legs. What all this adds up to is the body of master contortionist, and death on four-paws for small rodents. Weasels also have excellent low-frequency hearing and whiskers on the snout and elbows–useful for navigating in the dark. They have strong jaws and a scissor bite. Basically, they’re a mouse’s worst nightmare. But this expertise comes at a cost. A long, small body means rapid heat loss and a high fuel bill. Long-tailed and short-tailed weasels need to consume, give or take, about a quarter of their body weight every twenty-four hours simply to stay alive. Now consider our cold winters, the energy requirements of hunting, and the fact that rodent populations are boom and bust. Weasel populations tend to rise and fall along with that of their preferred prey, and even in a good year, starvation is a common cause of death. In this context, it’s easy to understand why weasels, unlike most predators, may put themselves in hunting scenarios that involve high odds of injury. When a 12-ounce weasel attacks a four-pound snowshoe hare and risks a lethal kick, or ricochets off a man’s pants in pursuit of a squeak, this may be the rational choice between the possibility of harm and the dire cost of missing dinner. With apologies to Franklin Roosevelt, sometimes, for a weasel, the greatest risk is risk aversion itself.